As an easy guide for you we have created this simple cross reference guide to help you find the part you need. If you have one of the part numbers listed below, simply match it to our part number. Give us a call for for more information or visit our online store to purchase. Presair designs and manufactures adjustable pressure and vacuum switches. Presair switches are UL and CUL Recognized. 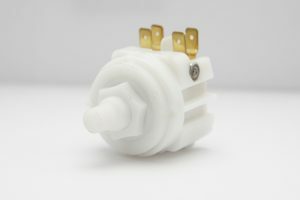 All switches are made in the United States and our direct customer service would be happy to help you find the right switch for your application. These compact pressure and vacuum switches are produced to exacting standards to meet the needs of original equipment manufacturers and instrument makers for a low cost, stable, repeatable switch. Plastic mechanisms and housings are acetal to minimize moisture absorption and maintain dimensional stability. Plastic welding is accomplished using advanced microprocessor controlled ultrasonic welding equipment. All switches are 100% tested at high and low settings and at the proof pressure. Units are delivered with the setpoint at the low end of the adjustable range. The pressure switches and vacuum switches are field adjustable using the hex head set screw at the center of the pressure switch. Custom pressure and vacuum switches are available; please contact us for price and delivery. Custom options include factory setting at specified setpoint and DPDT switches can be configured for different pressure settings. Click an option below to view more product details or purchase in our online shop. Can’t find your part number listed? Give our direct support a call with your switch or application requirements and one of our customer service representatives will assist you! **Tip: Search this list for your part number using the Find function of your browser – Google Chrome’s shortcut is ctrl-f. Range: 2 inches of water to 300 inches of water.